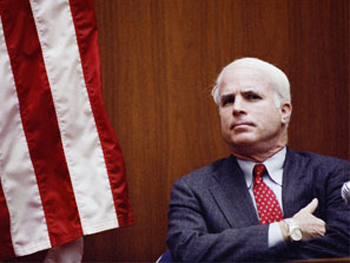 John McCain has made his ethical piety the centerpiece of his 2008 Presidential campaign. After getting caught with feathers in his whiskers in the Lincoln Savings and Loan Association/Keating Five scandal, and making no friends in the press in the process, John McCain sought to reinvent himself in the 1990s. He’s run his 2008 campaign officially decrying “special interests lobbyists with the fattest wallets,” and has pledged that there’s no room for that kind of conflicted taint on the Straight Talk Express. So, it’s been a bit problematic of late that the McCain Campaign has had to shed a number of compromised campaign officials when the soiled workclothes from the many dirty jobs on their lengthy resumes–defending the interests of Myanmar, erstwhile Phillipine dictator Ferdinand Marcos, Zairean kleptocrat Mobutu Sese Seko, Angolan terrorist leader Jonas Savimbi, Somali dictator Mohammed Siad Barre, Nigerian dictator Ibrahim Babangida, the Iraqi National Congress (remember Wolfowitz’s and Cheney’s hero, Ahmed Chalabi, who was waiting with his U-Haul in March 2003 when we opened both barrels on Iraq–and with whom the United States military just this month cut its ties over Chalabi’s recent contacts with our new WFF, Iran) and many others–have threatened the sully the virgin whites of McCain’s pristine reformer campaign. One of these who hasn’t gone of his own volition, and is in fact more prominent in the campaign than ever, senior adviser Charles Black. Charlie Black is the head of BKSH Associates. Black cut his teeth in the firm of Black, Manafort, and Stone. Before Black, Manafort, and Stone, it was considered poor form to represent both politicians and political interests. In a challenged and overextended economic environment, though, it’s just bad sport on the part of the government to keep its boot on the market’s neck and constrict opportunity like this. Black, Manafort, and Stone were visionary enough to see this for what it was. Thomsas Edsall quoted Black in today’s Huffington Post, “I think there is a great advantage in dealing with people who you personally know and trust . . . most importantly, can they [elected officials] trust you [the lobbyist] to tell the truth . . . there is an advantage to the client and to the person in position of authority to deal with someone they know and trust,” Black said. MotherJones Blog released a list of 220 clients BKSH has represented since 1998–Bristol-Myers Squibb, Glaxo SmithKline, ChevronTexaco, Occidental Petroleum, Johnson & Johnson, Pharmanex, Tobacco Quote Warehouse Alliance, Yukos Oil–for a total of $57 million and change. To assume that would buy any influence in Washington would be presumptuous, even cynical in the eye of a darker soul. And just considering the client examples above, I think the level of good-feeling about the pharmaceutical, petroleum, and tobacco industries by the American consumer is its own validation of the effectiveness of Black’s lobbyist-politician Weltanschung. And if we parse that liberally, that might be true: They don’t need to throw their money there, because their hired guns already have corner offices in Straight Talk, Inc.
Well, not so fast. If you’re worried about your health care and having to spend more and more every week to fill up your gas tank, and you have your vote to give to a campaign, are you going to give it to the candidate who promises to fix the problem, or the candidate who promises to fix the problem and has paid representatives of the pharmaceutical and petroleum companies running their campaign? The first candidate may still betray your faith–’tis the nature of politics, after all–but the second candidate already has. Until recently, there’s been an enormous disconnect and arrogance at play in the McCain campaign that they really feel like no one is going to connect the dots in a way that the voters who drip gravy onto their wife-beaters can understand. He’s been lucky to have the Barack-and-Hillary donnybrook capturing everyone’s attention, but as Hillary dangles on the ropes and Obama offers a passing jab or two to keep her there as the clock on the 15th round winds down on the undercard, a few curious eyeballs have gone ahead in the program and started really looking at the heavyweight coming out on the main card.